In the world of mobile marketing, acquiring new users is only half of the battle. Keeping those you do find is what determines the survival and longevity of your brand. At a time when retention trends indicate that most apps lose upwards of 77% of new users within three days of install and 90% by 30 days out. The question becomes: How can you defy the norm? 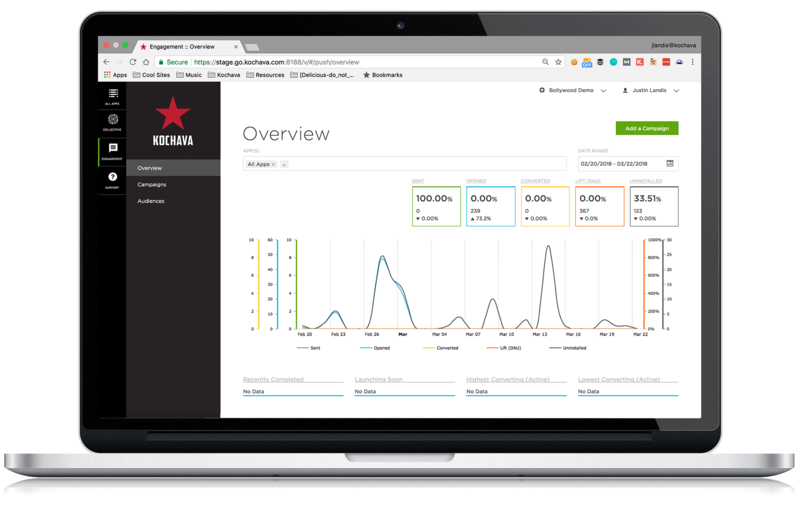 Using the tools in our Kochava Engagement gives marketers that advantage and convenience of having advanced, automated tools in one location. The launch of Engagement introduces in-app push messaging to the Kochava toolset. Now, you can send contextually relevant push messages directly from Kochava, based on the rich analytics data tracked from your app, all without having to download and reformat spreadsheets for use in a separate tool with disparate metrics. Push notifications give marketers the ability to further engage users and attribute their owned media efforts. It has the advantage of a direct, app-related message to a qualified audience of users who have the app installed and have opted to receive push messages. With Engagement push notifications, marketers have the ability to send automated push campaigns based on user behavior. It is the first platform to connect attribution and measurement with automation. Push messaging must be used strategically, with contextually relevant content and delivered with the right frequency. Given the parsed attention of the average user today, too much irrelevant content or poorly targeted push campaigns can result in users opting out of push messages from your app or worse, deleting your app entirely. Engagement push notifications by Kochava makes it simple for app marketers to find the ideal audience timing, frequency, and messaging to maximize engagement and ultimately the lifetime value of your users by providing the right features to reach your users through contextual push messages based on in-app, behavior-driven triggers. Engagement enables marketers to segment and define audiences by language, geo, device type and operating system. They can add the type of in-app behavior they like. For example, one streaming company targets users who have completed three free video views but whose subscription to the service has lapsed. Marketers can leverage this audience data to create dynamic, contextual messaging; use multivariate testing to determine which messaging is most effective; anticipate and automatically react to leading indicators of churn; and visualize lift from these campaigns directly within the Analytics dashboard. Engagement also enables attribution of owned media, so marketers know whether a purchase came from their own push notification campaign or from a paid media source. The Kochava system automatically optimizes toward the most successful variant, freeing the marketer to a large range of potential messaging variations without worrying about manual optimization of the resulting data. Analyze trends in uninstall behavior correlated across audiences, behavioral events, messages, and campaigns. Send the best message to users at the right time with Engagement. Multivariate test, create audiences within Analytics, segment based on rich user metrics, schedule and trigger messages, and track the effectiveness of your push campaigns, all within the Kochava platform. To get started, contact your Client Success Manager or visit our support documentation. Kochava is a leading mobile attribution and analytics platform, with all the right features to be the only partner you’ll ever need. Contact us for more info!